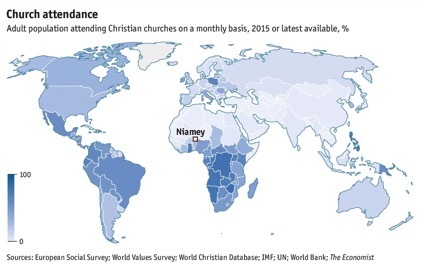 The centre of world Christianity is .... Niamey? Just 70m of Western Europe’s 375m adults attend church at least once a month. Meanwhile, in sub-Saharan Africa and Latin America, the church appears as strong as ever. There are 277m adherent Christians in sub-Saharan Africa and 250m in Latin America. As Christianity has shifted southwards, that has moved the centre of Christianity to Niamey, the capital of Niger (calculated by taking the Christian-adherence weighted-average latitude and longitude of countries' capital cities). As the crow flies that is 2,433 miles from Bethlehem. Q. If someone from Nigeria is a Nigerian. What do you call someone from Niger?